A project management app is only beneficial if workers actually spend less time interacting with it and more time getting their work done. Our AEC software specialists build, configure and customize construction project management systems with the direct aim of simplifying and streamlining operations. Chetu develops cloud-based AEC (architecture, engineering and construction) project management systems with custom work status dashboards, workflow management tools, and digital workrooms for collaborative design, planning, and project execution. We build specialized project management applications for AEC. Our construction project management apps are programmed for managing features and processes such as automated time stamping, voice recognition commands, time/attendance tracking, and contact databases. We also develop cross-platform mobile apps with full access to construction document management systems. 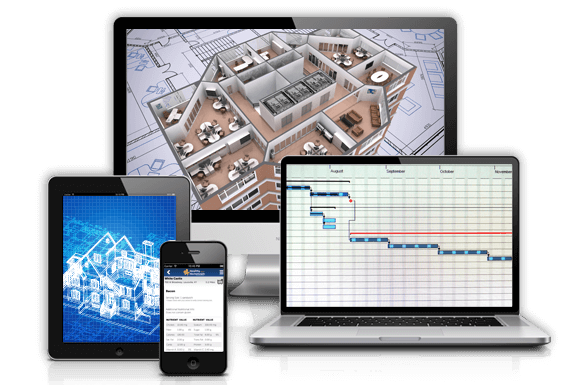 We design collaborative project management software for construction firms that are fully functional from desktop and mobile devices, as well as web apps. Users with appropriate role-based access controls can make system-wide changes to project specs, punch lists, and timelines in real time. We ensure compliance with Occupational Safety and Health Administration (OSHA) requirements, including seamless submissions for site inspection reports, as well as injury, illness, and incident reports. We also integrate jobsite excavation tools, geo-fencing alerts, harmful noise detectors, and other jobsite safety programs.